The average cost of assisted living in Savannah is $2,621 per month. This is lower than the national median of $3,346. Cheaper nearby regions include Port Royal with an average starting cost of $2,500. To help you with your search, browse the 125 reviews below for assisted living facilities in Savannah. On average, consumers rate assisted living in Savannah 4.2 out of 5 stars. Better rated regions include Richmond Hill with an average rating of 4.5 out of 5 stars. Caring.com has helped 7 families in Savannah find high-quality senior care. To speak with one of our Family Advisors about assisted living options and costs in Savannah, call (855) 863-8283. Savannah is the oldest city in Georgia; residents and tourists can peruse Savannah’s National Historic Landmark District, gaze upon the Savannah River, visit the iconic statue of the waving girl, take a ghost tour and enjoy seasonal events like the city's annual food and wine festival and annual film festival. Seniors in Savannah will have endless things to do outside of their assisted living communities. The 10 assisted living facilities in Savannah and additional three in the surrounding area are regulated by the Georgia Department of Community Health. Located along the Atlantic coast, Savannah has a subtropical climate, categorized by long, sultry summers and brief, cool winters. The city is also at risk for hurricanes that travel along the east coast. It was most recently affected by Hurricane Matthew in 2016. Savannah has an array of community resources for seniors, including The Learning Center, an organization that promotes life-long education and intellectually-engaging activities, as well as four senior centers. Living in Savannah is much more affordable than other parts of the United States. The cost of living is 14 percent lower here than the national average. The Savannah area is home to world-class medical facilities, including Landmark Hospital of Savannah and Georgia Regional Hospital, in the event of medical emergencies or illness. Chatham Area Transit provides regular public bus service throughout Savannah. In addition, there are free buses that operate throughout the downtown historic district. Savannah is a living history museum all by itself. The historic district is filled with 19th century homes that help illustrate Georgia's past. In addition, the city is home to the Telfair Museum of Art, the first public art museum in the South, and the City Market, a restored market building that houses a variety of restaurants and retailers. Assisted Living costs in Savannah start around $2,621 per month on average, while the nationwide average cost of assisted living is $4,000 per month, according to the latest figures from Genworth’s Cost of Care Survey. It’s important to note that assisted living rates in Savannah and the surrounding suburbs can vary widely based on factors such as location, the level of care needed, apartment size and the types of amenities offered at each community. 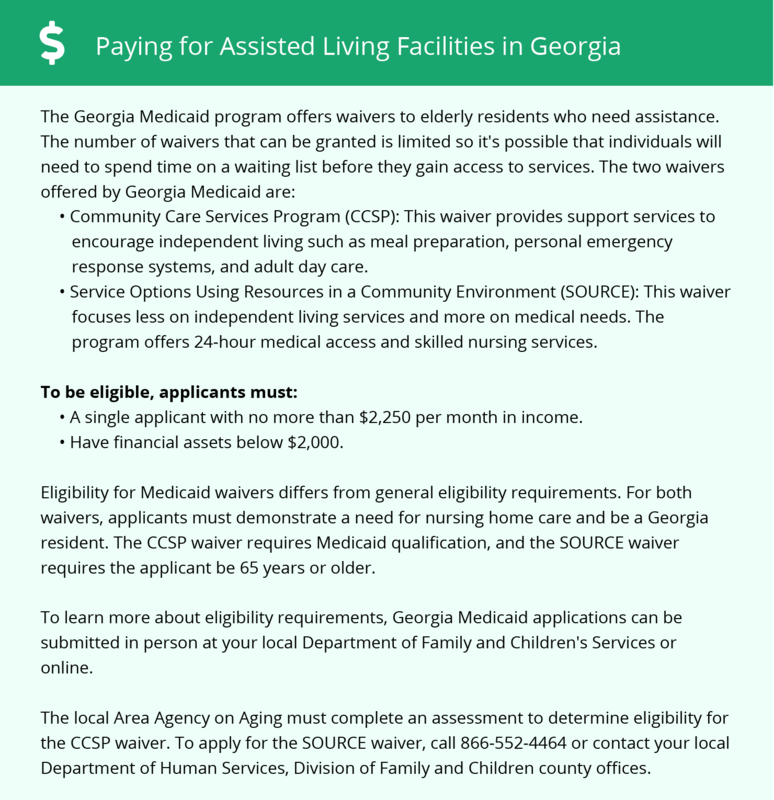 Those in Georgia who need assistance with finance typically apply to the Community Care Service Program (CCSP), which is specifically for those who do not require a nursing-home level of care but need extra help with the tasks of everyday life. For those who need more intensive care, Service Options Using Resources in a Community Environment (SOURCE) is the next stage. Savannah and the surrounding area are home to numerous government agencies and non-profit organizations offering help for seniors searching for or currently residing in an assisted living community. These organizations can also provide assistance in a number of other eldercare services such as geriatric care management, elder law advice, estate planning, finding home care and health and wellness programs. To see a list of free assisted living resources in Savannah, please visit our Assisted Living in Georgia page. Savannah-area assisted living communities must adhere to the comprehensive set of state laws and regulations that all assisted living communities in Georgia are required to follow. Visit our Assisted Living in Georgia page for more information about these laws.